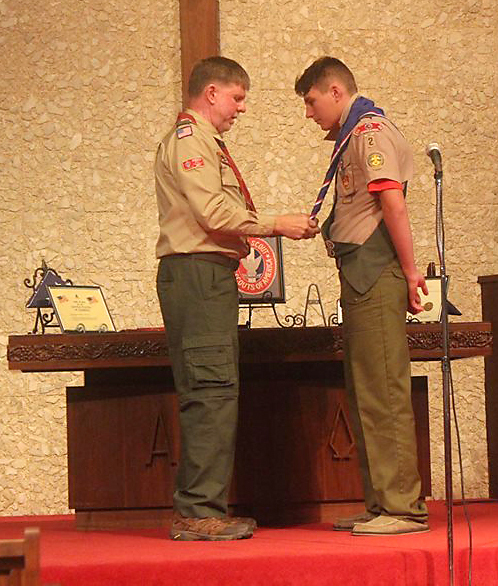 During an Eagle Court of Honor ceremony, Scoutmaster Mike Taylor, left, presents Justin Daughtrey the highest achievement in the Boy Scouting program, the Eagle Scout Award. Justin Daughtrey, a freshman at North Lamar High School, received his Eagle Scout Award during an Eagle Court of Honor ceremony on Saturday, November 24, at Calvary United Methodist Church. Scoutmaster Mike Taylor made the presentation after Daughtrey and Paris Boy Scout of America Troop 2 worked to restore the nature trail at Parker Elementary School as Daughtrey’s Eagle Scout project. 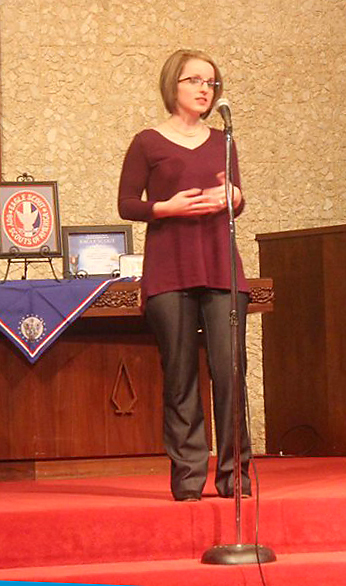 Aaron Parker Elementary principal Kristin Hughes speaks as the beneficiary of Justin Daughtrey’s Eagle Scout project, the Restoration of the Parker Nature Trail.